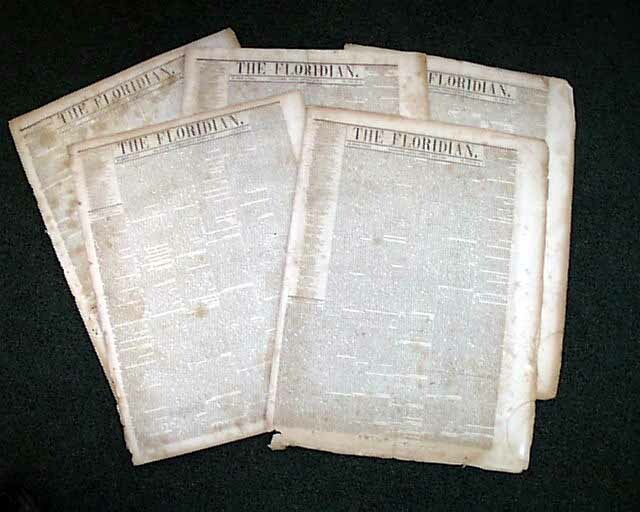 Item # 649237 (5) THE FLORIDIAN, Tallahassee, Florida, 1840's A lot of five issues from just after Florida’s statehood. All are a bit “2nd rate” (staining, rubbing, close-trimming, etc. ), but are not damaged. A very popular lot. Dates included are 1846: Dec. 26 and 1847: June 12, June 19, July 3 & Aug. 21. Issues from early Florida are very difficult to find and are quite collectible. A great set at a bargain price.